Bacon Pancakes: Oh yeah! Add chopped bacon to pancake batter or pour batter over full slices for a surprising savory treat! Peanut Butter Pancakes: Add 1/3 cup peanut butter (or any nut butter) to batter prior to cooking. Pumpkin Pie Pancakes: Add 1/3 cup pumpkin puree and 1/2 teaspoon of pumpkin pie spice to batter before cooking. Apple Cinnamon Pancakes: Add 1/3 cup applesauce and 1 teaspoon of cinnamon to batter prior to cooking. Apple Cinnamon Pancakes, Take 2: Add 1 finely diced Granny Smith Apple and 1 teaspoon of cinnamon to batter prior to cooking. Triple Berry Pancakes: Add 1 tsp vanilla and fresh or thawed frozen blueberries, raspberries, and diced strawberries to batter prior to cooking. Maple Nut Pancakes: Add 1/3 cup chopped walnuts and 2 tablespoons maple syrup to batter prior to cooking. Island Pancakes: Add 1/3 cup crushed pineapple (drained), 1 teaspoon of cinnamon, and 3 tablespoons shredded coconut to batter before cooking. 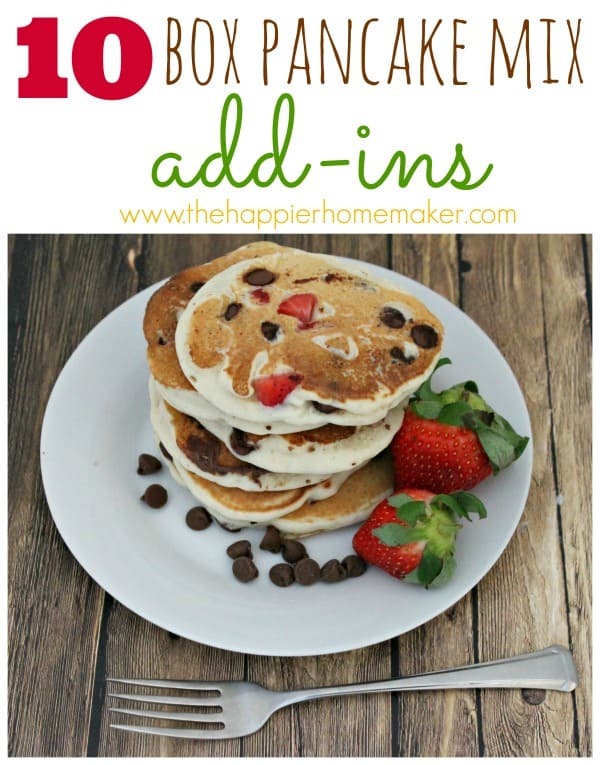 I hope you all like these ten pancake add in ideas, I’d love to hear what you like to add to your pancakes at home too, leave it in a comment below to share with everyone! Reece’s peanut butter chips are delicious in pancake batter. Also I mash a ripe banana in a bowl with a little half & half mix well then pour this in your pancake batter….delicious! I love putting cinnamon, bananas and chocolate chips in my pancakes. Nice and mixed? Very delicious!